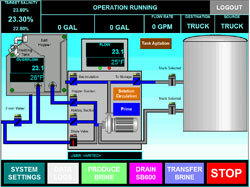 The Brine Boss® is an automated, touch-screen controlled unit that is used in conjunction with VariTech Industries salt brine production systems, (SB600 or HSCB1400-SS). The Brine Boss produces cleaner, more consistent brine-faster than ever before. Clear, bright screen makes page navigation smooth and easy even in low light conditions. Ensures that target salinity and system settings can only be accessed through password verification. Allows multiple users such as State, County, and City personnel to use the same system while tracking usage per group. Allows the administrator to view and transfer data such as salt used, gallons of brine produced, truck ID numbers, date, and time to name a few. Add-on software packages allow the administrator to download and transmit the information to remote locations. Stainless steel centrifugal pump coupled to a TEFC motor and poly housed ball valves with stainless steel balls will provide years of dependable use. The system allows for loading and offloading of mobile truck tanks while tracking truck ID, date, time, and gallons dispensed. Our Interface monitors water temperature to make sure the brine that is produced is consistent each and every time. Producing and pumping brine to multiple storage tanks is no problem at all with add-on valve and hose packages.